not only our beloved State of North Carolina, but our neighboring states too. We have been blessed to have not lost power or have any significant damage. dealing with the rising waters. We are awaiting our friends from Jacksonville, N.C.
to evacuate to our house as soon as the roads clear for them. So hopefully our Floral Friday will be a little bit of a bright spot in these times. 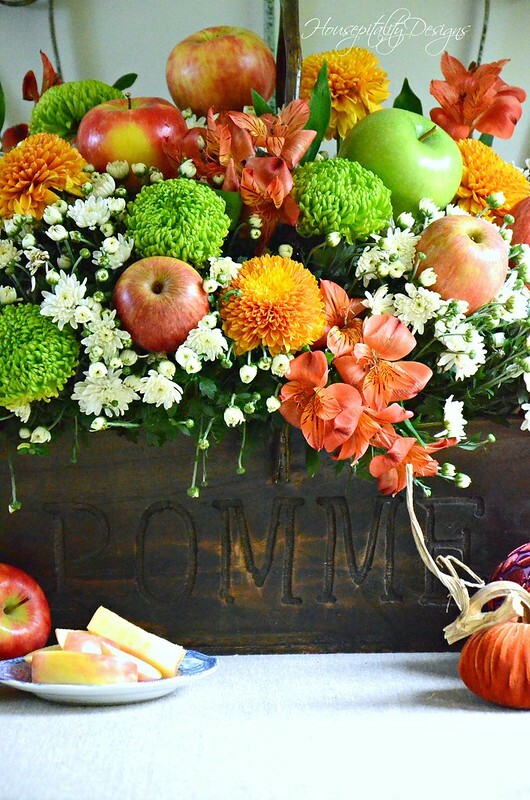 Today’s Floral Friday theme is Fall Apples. 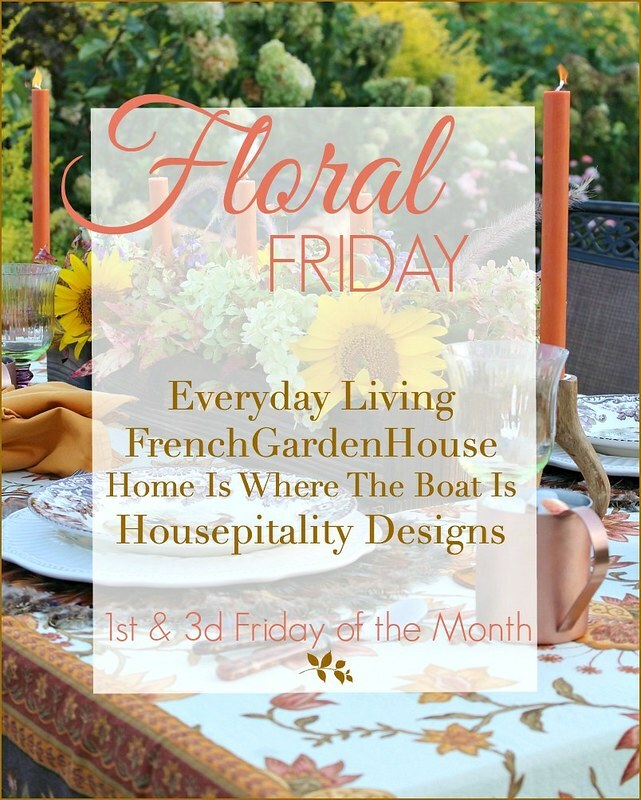 to bring you another Floral Friday filled with ideas that you can create for your own. Their most beautiful images are below for the greatest floral inspiration! Links to their posts are below their images. So here we go . 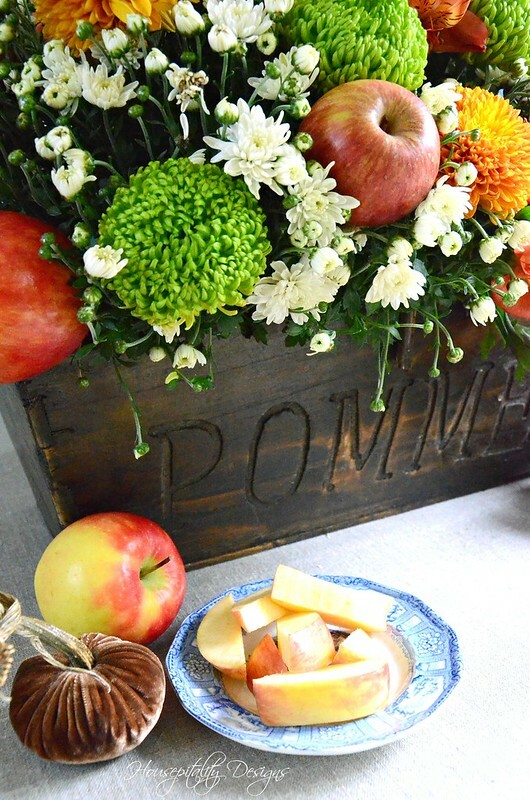 . . we are Falling for Apples – Floral Friday! lighting umbrellas and it was dreary, windy and raining as I took these photos. in the “storage box room” It was meant to be as I found it right away….yay! So I gathered these flowers and materials I needed. I grabbed flowers first! Priorities . . . then the food and water and pumpkins too! along with green and red apples. 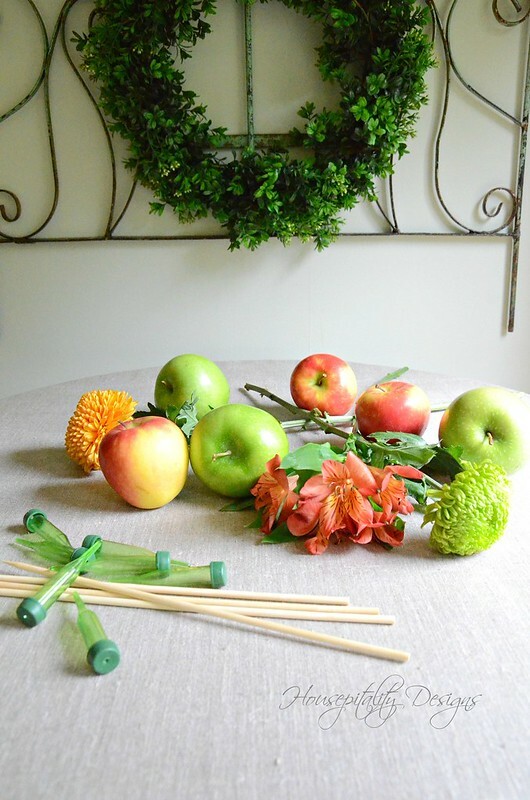 Skewers for the apples and aquapics for the flowers. for the “base” flowers in the arrangement. and work my way down toward each end of the container as you can see above. and a bit of a cascading effect. It has the same effect at the edge of the container. at one of my favorite stores, Arhaus, several years ago. paying attention to the spacing and uniformity of the apples in the arrangement. Hoping that they would become the star of the arrangement. The word “POMME” on the box is French for Apple! in-between the stems of the potted mums. This also makes it easy to replenish the water when needed. I would display them all year round as they are the prettiest and just makes you smile! I staged this arrangement in a corner of the sunroom at the Berry Patch House. I hope to soon bring you a post of the sunroom….it is quite large! We are off to another adventure with the “Boys” soon. They will be playing the Western U.S. Champions . . . The Boys won the Eastern title. So East meets West in the National Championships! I came across a large piece of cloth that I bought in France several years ago. on one side and vinyl coated on the other. So another Floral Friday for you to enjoy today. 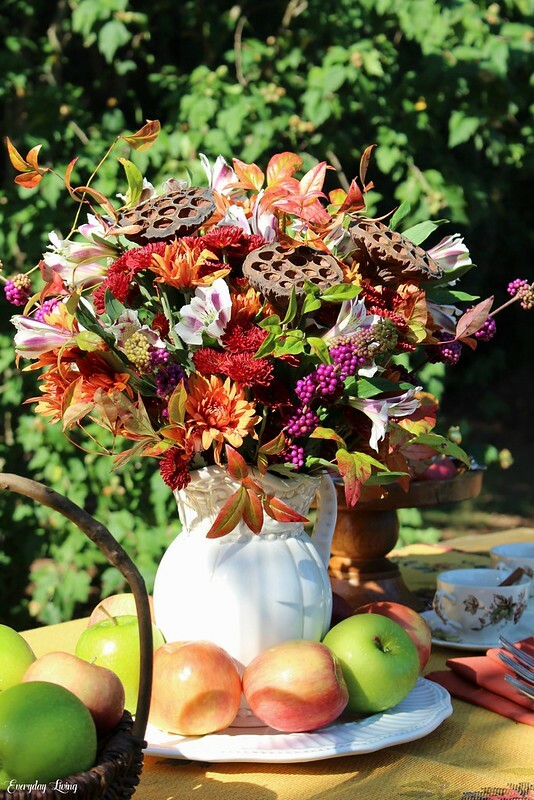 as their Fall Apple inspired floral designs are spectacular and not to be missed! Their links are at the bottom of each image. I wish you all a most beautiful day and weekend and thank you for visiting!! LOVE the idea of using potted mums as the base of your arrangement! I am so copying that! I also love the Pomme basket! I know nothing about using lighting umbrellas, will have to research that. Thanks for all this beautiful floral inspiration. Have a beautiful weekend with the boys!!!!!!!!!! Such a beautiful floral arrangement, Shirley. Thank you for sharing. I’m glad that Florence left you alone. 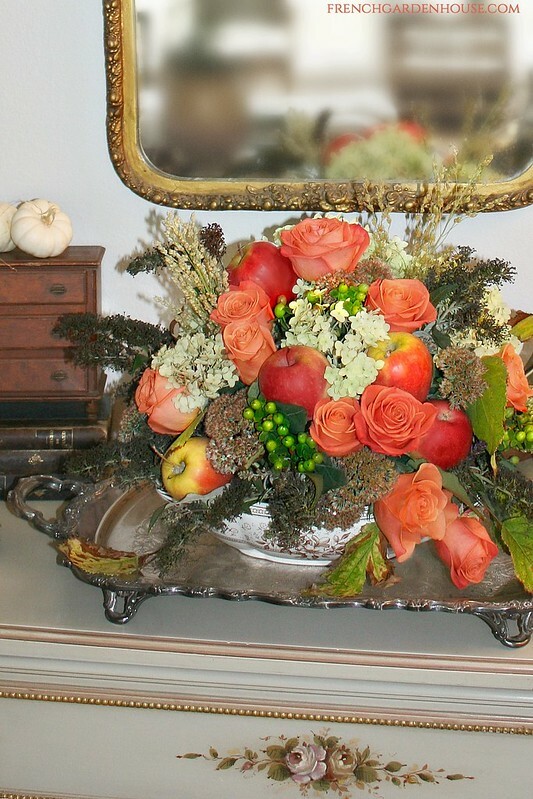 Shirley, such a stunning fall arrangement! The colors are so rich and vibrant…perfect for autumn! The basket is adorable and makes a perfect container. I am swooning over that gorgeous iron piece on the wall. Happy Fall, sweet friend!!! Oh Shirley, I am so relieved to hear you are safe and dry, my heart has been heavy this past week worrying about all my Carolina and Virginia friends! 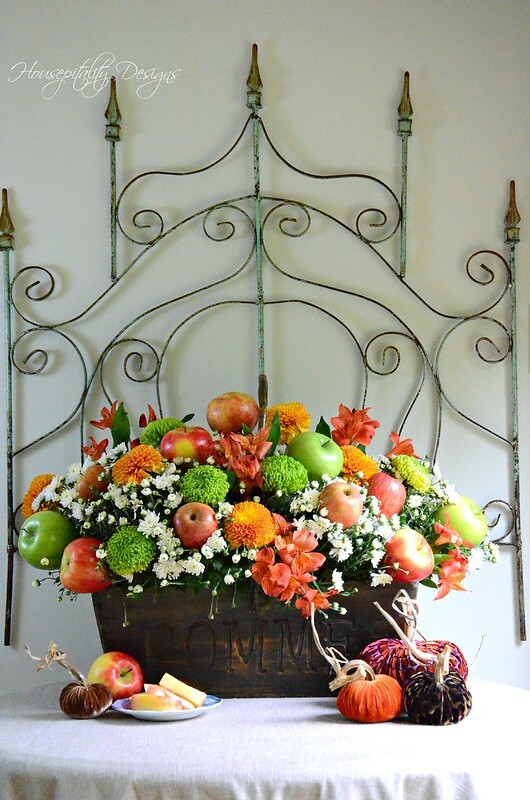 Your arrangement is stunning, and how brilliant to use a mix of potted plants, apples and flower stems. How perfect to just happen to have a french apple bucket! I love the combination of colors and textures you chose, just right for this time of year when we Southerners are itching for fall but it’s still so hot! I just love Floral Fridays! To say that I’m in love with this post, does not even begin to cover it! That “Pomme” basket! How utterly perfect! 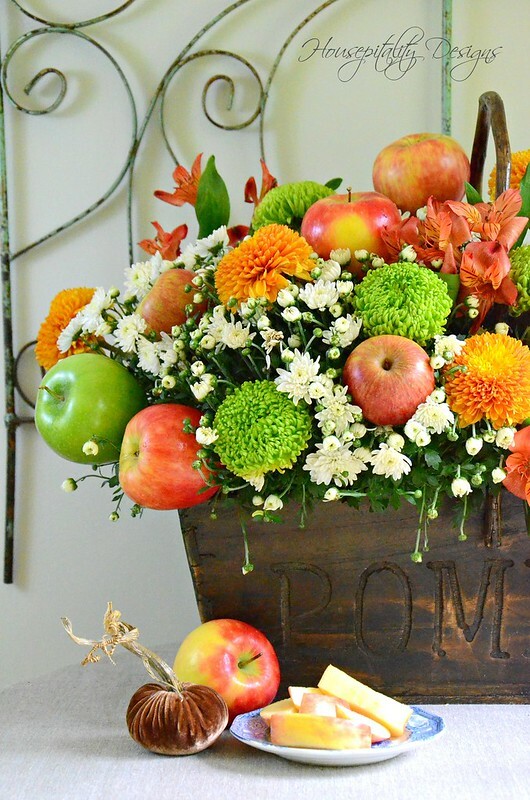 Love the flowers, the apples, the colors, the way everything was arranged . . . 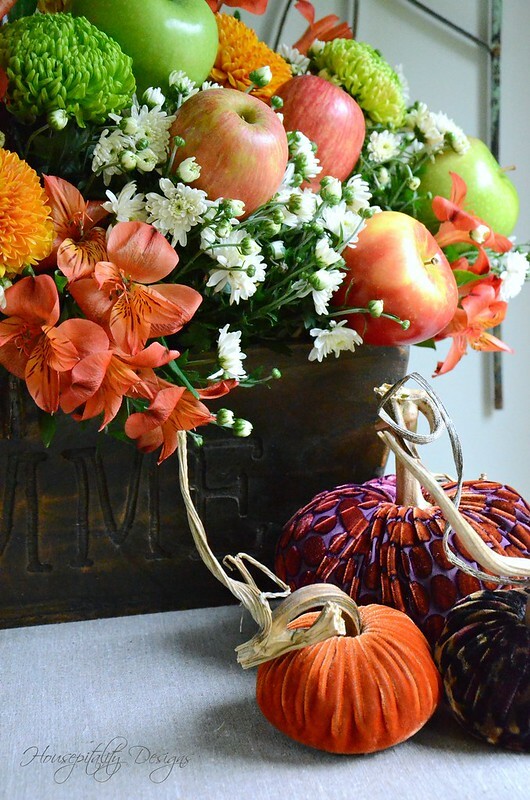 I also love the velvet pumpkins next to the arrangement. I think I need some of those velvet pumpkins! What a delightful post! Lovely, Shirley! I love how full and bushy the pomme basket turned out. Congrats to your hubby’s team, and prayers of endurance for all your friends impacted by Florence. My daughter’s in-laws only sustained relatively minor damage at Oak Island, and that’s a miracle considering they had over 26″ of rain! 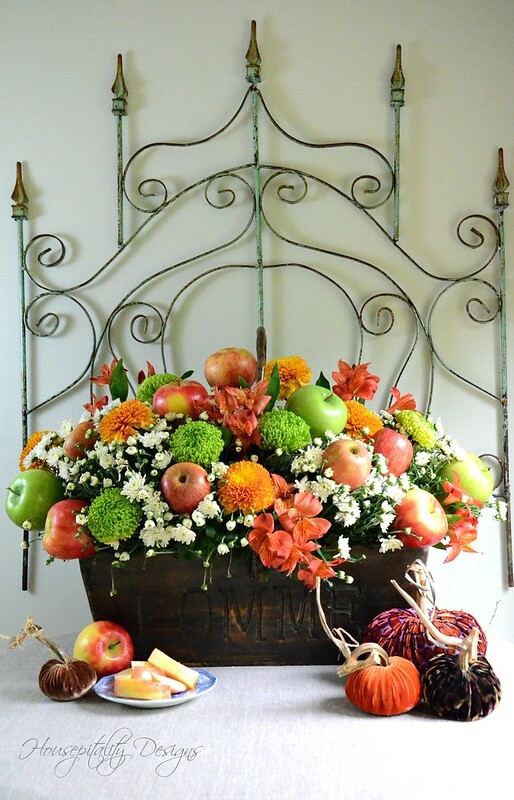 Shirley, I love your fall arrangement in the French apple basket! Have a great trip and good luck to your hubby and his team! So beautiful Shirley! I love that you were able to use potted mums, and then flowers in those ever-so-handy floral picks. 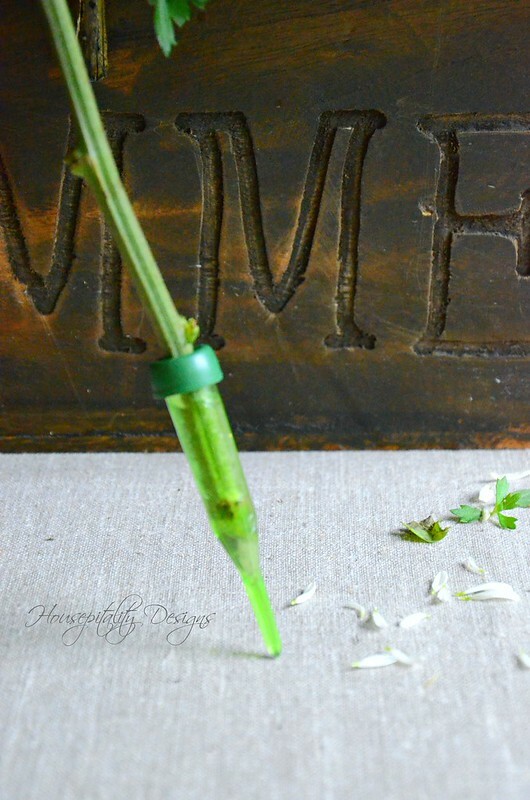 I use them to add fresh flowers to wreaths, too! You have such a talent for making not just beautiful things, but cheerful arrangements that always bring a smile to my face. That is so beautiful! Love the way you displayed the apples. Good to know you are safe- so sorry for all those suffering after the hurricane. That will be wonderful for your friends to have such a lovely place to come stay with you. I can’t imagine all they’re going through. On the road to PA today. Florence has been such a nightmare, and her aftermath is no different. All in her path have suffered so. I don’t know that I’ve ever been more aware of the devastation hurricanes bring than in the past 20 years or so. I think I focused solely on the tornadoes we faced here. We’ve had some doozies! But now I know when hurricane season begins and ends, and I could probably name quite a few of the most recent ones! All of you ladies did a phenomenal job with your floral designs!!!!!! A nod to fall without completely dismissing late summer. Just fabulous!!!! Happy first day of fall! Your arrangement looks beautiful. 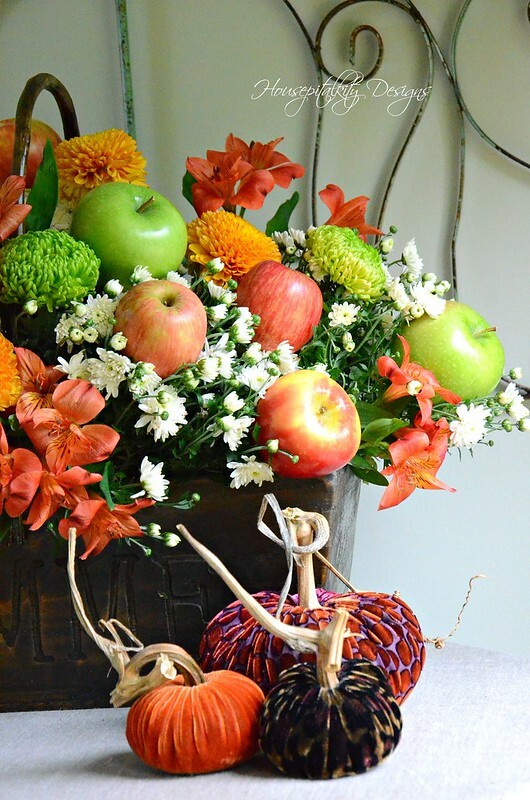 Very striking fall arrangement. 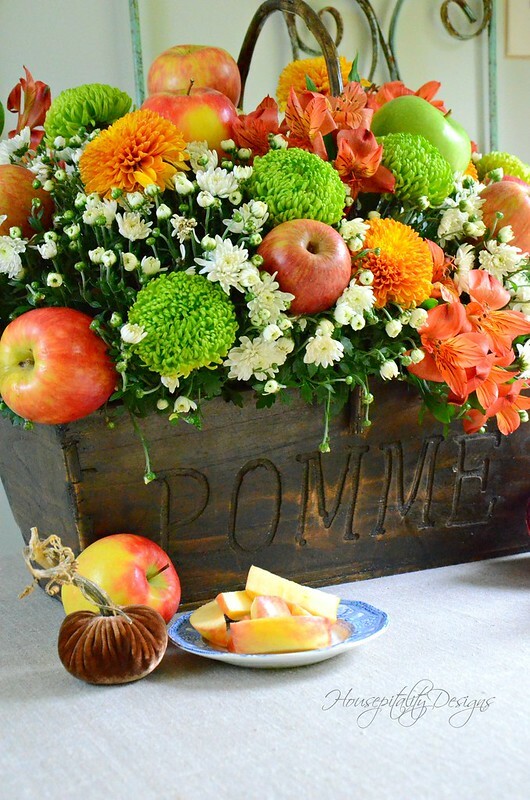 The basket with pomme written on it was perfect for your theme. Clever idea to use mums in pots as your base to stick floral pics in for fall accent flowers. Glad you did not have any damage from the storm. 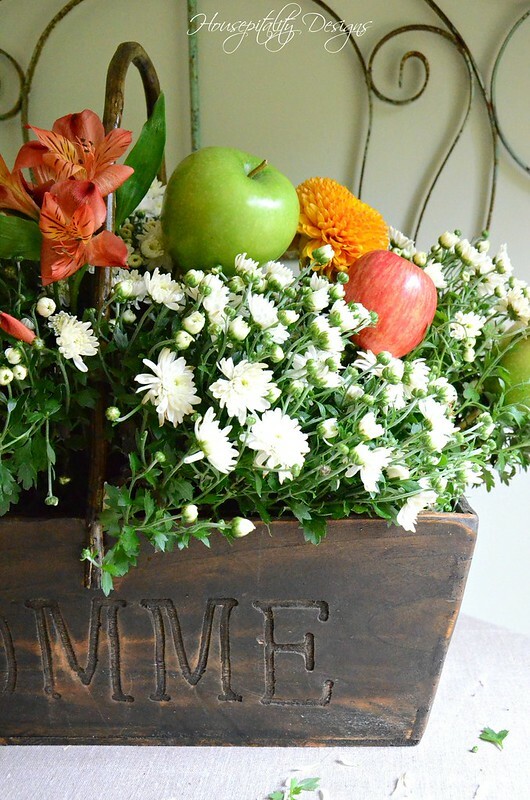 How inspiring!Your arrangement is adorable! So cheerful looking, Shirley, and just the perfect container! So very happy to hear y’all made it through Florence without severe issues! My oldest son and dil live in Myers Park, NC (just south of downtown Charlotte). We kept hearing news reports of creeks flooding there and large downed trees but, other than some fallen small branches, they were fine–thank goodness! Hugs! 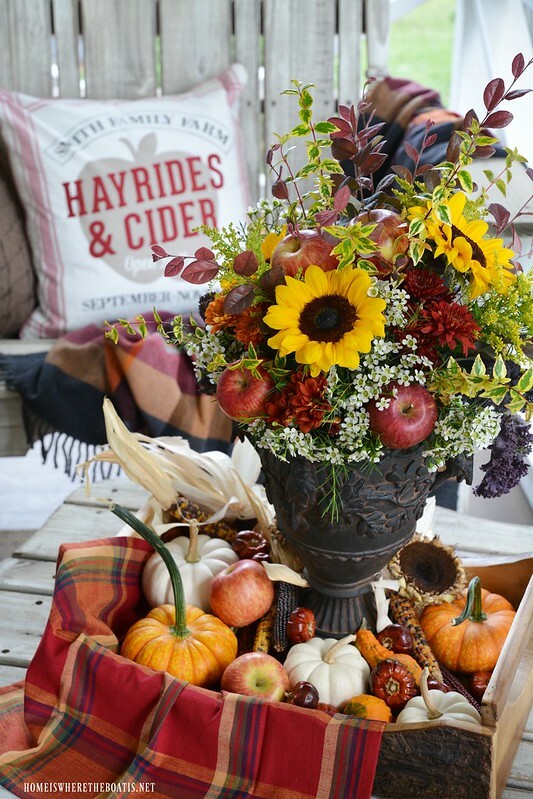 This is a beautiful fall arrangement. I love the container and the how yous started with potted mums and then added the extras. Just perfect! Hope you are enjoying your vacay!